Yeah, late update today. I do have a job, you know. 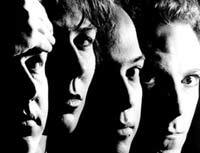 A sneak preview of the Pixies reunion? Check out this Quicktime video of Joey Santiago jamming “Gigantic” with the Breeders. The sound and video quality is a bit crap, but they certainly look like they’re having fun. How much fun would it have been to have been at that gig? From Bradley’s Almanac, freshely returned from his adventures in Britain. In the meantime, Reuters has an interview with the band’s agent about the Spring warm-up tour, the Summer European tour and the Fall North American tour. 4AD has rescheduled Rachel Goswell’s debut EP The Sleep Shelter for May 10, and it will be available as a digital download the same day. The album, Waves Are Universal, is to follow later this summer. 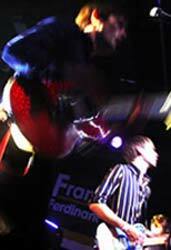 The French Kicks are at the Horsehshoe May 27, On The Speakers (ex-Creeper Lagoon) support. M Ward is opening for My Morning Jacket May 28 at the Opera House. The website and schedule for the Over The Top Festival are now live. It runs over the last weekend in April and features a broad range of acts. I’m personally looking at Sneaky Dee’s on the 30th (Volcano, I’m Still Excited, The Besnard Lakes, Masters and Moderns). After going through an experience seemed as painful as pulling teeth to secure an interview with Cerebus’ Dave Sim, The Onion brings you the interview proper, an experience which reads to have been as painful as having those previously pulled teeth ground up into a lumpy paste and injected intravenously while a class of second-graders makes disparaging comments about your complexion and throw dodgeballs at you. 24 finally came back this week – all new episodes till the end of the season. Things are finally getting better all around, at least. Jack has yet another bad guy blow up in front of him, Michelle finally gets to cap a civilian, Gael has a nosebleed and Palmer remembers why he divorced Sherry in the first place. “Oh yeah, she’s a psycho hose beast”. Sorry, Wayne’s World was also on. A pity Kim didn’t get to do anything stupid, but I’m sure she’ll get the opportunity. I’m a little disappointed that there doesn’t seem to be a long history between Jack and the Big Bad this season – if there was, I’d think that he’d recognize the voice or something. Same goes for the president. Things are so much jucier when they’re personal. This dude better have some good demands… like bringing lesbian assassin Mandy back into the mix! Mandy! Mandy! It’s interesting to me how touring bands from the US feel compelled to tell us how much they love playing in Canada. I’m not sure if they’re genuinely expressing affection for our home and native land or just trying to tweak our internationally renowned inferiority complex. Last night, some of The Decemberists were sporting Canada toques newly bought at a Niagara Falls gift shop or playing instruments with Canadian flag stickers affixed. Cute. At some point, the UK’s Clearlake were taken off the bill, I’m not sure when, likely because they’re opening for Stereolab at the Phoenix on April 10. I was a little disappointed as they sounded interesting, but it did mean the show would be starting that much earlier meaning I’d be home that much earlier. That left Tom Heinl as the sole opener, and with his charming and often hilarious ‘Stereoke’ act which featured him singing along to his home 4-track tapes with the vocal track removed. His stage setup consisted of a double cassette deck, home stereo receiver, rocking chair and old living room lamp, among other sundry objects, and he alternated singing songs about IHOP, trailer parks and his many wives with readings from his fifth-grade diary. Bizarre but very entertaining. The Decemberists played a joyous, concise set to a very full house, favouring the more upbeat numbers from their two albums and closing with a full reading of their new single/EP “The Tain”, which clocks in at a solid 18-minutes with several movements combining folk, prog and seventies hard rock influences and based on an ancient Irish myth. Yeah. I always enjoy seeing complex and intricately arranged music reproduced live, and the Decemberists used a whole aresenal of instruments, including accordians, xylophones, melodicas, mandolins, and upright bass alongside the more conventional band instruments to successfully recreate their records while Colin Meloy tunefully bleated out the lyrical intricacies of the material. They rocked out a little harder than you might have expected from a band with such a resolutely geek image, particularly when Tom Heinl joined the band in the trombone-demolishing encore closer “I Was Meant For The Stage”. A very solid Toronto debut for one of the more ambitious and unique bands on the indie landscape right now. Pics from the show. Those Lollapalooza rumours from last week? Billboard says they’re true. I will reserve judgement until a) I see the rest of the bill, b) I see if they’re coming north of the border, and c) I see how much tickets are. I’m really not one for big outdoor festival-type shows, but I would like to finally see The Flaming Lips… Also confirmed on the bill are Modest Mouse. Hayden’s new record Elk Lake Serenade will be coming out May 11. Want to know the extent of my celebrity elbow-rubbing here in the T-dot? I was at a bar Saturday night and Hayden was there, and then I went to another bar and Moe Berg from The Pursuit Of Happiness was DJ-ing. This jet-set lifestyle, it’s so glamorous. Pitchfork’s feature this week is a studio diary by John Darnielle of The Mountain Goats from May of last year. Tickets for The Cardigans show at Lee’s Palace May 8 go on sale April 8, 10:00 AM. Hopefully this won’t be Ticketmaster-only. The Toronto subway system is 50 years old today. Yaaaay. To celebrate, here’s a story from the New York Times about that universal phenomenon of subway crushes (yeah, you gotta register but the NYT is worth it). Ain’t it cute? From The Modern Age. Watching the Slow Century DVD has gotten me on a real Pavement jag. I’m somewhat annoyed with myself that it took me so many years to finally be able to wrap my head around what they do. I’d tried to get into them during their heyday, but besides the singles off of Crooked Rain, Crooked Rain, I just wasn’t able to appreciate their quirky brilliance. And now that I’ve I’ve seen the light, the band is gone and all I can do is follow SM and Spiral Stairs’ solo careers and hope to catch some glimpse of what they were in their prime (seeing PSOI on Thursday, for example). And watch the movies. And anticipate more archival releases like the Crooked Rain deluxe package this Fall. PJ Harvey’s new album is called Uh Hu Her and out May 31 in the UK, presumably June 1 in North America. NME has specifics and the tracklisting. Update: JAM! reports a June 8 North American release date. At a friend’s urging, I rented The Tao Of Steve this weekend and have begun reading Cad: Confessions Of A Toxic Bachelor. The former is a good-natured comedy starring no one in particular about an overweight fellow who still manages to be a ladies man, but is prompted to reconsider his lifestyle when he meets someone new and blah blah blah, you can guess the rest. Lightweight but alright. The latter is pretty much as the title implies – the non-fictional exploits of a cad. I’ve barely started so I can offer too much comment, but I’m pretty sure it’ll make me ashamed of my gender. It’s taken me all season, but I’ve finally just about secured last place in my hockey pool. It was touch and go for a while, but I think ultimately I will be proven to have had the correct instincts in picking the worst possible combination of players. I’d like to thank all the underachievers, the injury prone and everyone else who made this possible. Feh. Not much going on today. Decemberists tonight! 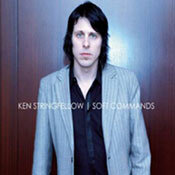 Ken Stringfellow’s new solo record Soft Commands will be out July 13 on Yep Roc. They’ve got an track from the record available to download as well. Stringfellow is without a doubt the hardest working man in indie rock – this year he’s got projects with Big Star, REM and The Posies in addition to the solo record. He doesn’t even seem to be able to find the time to dye his hair bright red anymore, the poor dear. I’m looking forward to the new record – his last one Touched was amazing. And on the topic of the Posies, their debut album Failure was just reissued. Fairly redundant by now, but here’s the official album listing at Nonesuch for A Ghost Is Born, complete with track times. Use it as a checklist for your downloading activities. They also have one for i, the new Magnetic Fields album. NOW talks to Neil Young about Greendale, Iraq, Dubya and the music industry in general. Neil is always a fascinating interview. Find a whole slew of XTC bootlegs and assorted sundry items here – all from before Andy Partridge went quite mad, of course. From Largehearted Boy. You knew it was going to happen – Franz Ferdinand are coming back to Toronto to rock your skinny white asses… oh wait, that’s THEIR skinny white asses. That are going to do the rocking. 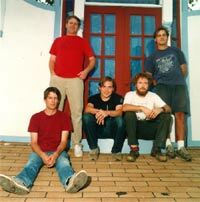 Regardless, they are continuing to strike while the buzz is hot and will be at the Phoenix on June 14, tickets $17.50. So I can officially say, “yeah, the show was okay but the one at the Horseshoe was SOOOO much better”. I won’t be surprised if this one gets moved to a larger venue, like the Opera House or Guvernment, before all is said and done. May 18 sees another NYC buzz band, The Scissor Sisters, at Lee’s – tickets $13.50. I’m not familiar with these guys at all but the reviews are uniformly positive. Can anyone comment on them? 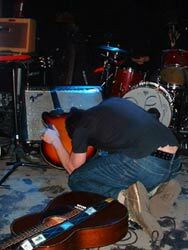 Jay Farrar’s dulcet tones will be caressing the ears of Torontonians June 17. There’s some confusion over the venue – Farrar’s website says the Horseshoe, Rotate This says Lee’s Palace. Last time through, Farrar played Lee’s but I wonder if he might be better suited to the more intimate ‘Shoe. Whichever it turns out to be, tickets will be $13.50. Curiously, Jay’s website also has him staying in town a few days, playing something called “Vaudeville, Mews” on the 18th and 19th, but the venue link takes you the website for a club in Des Moines, Iowa. Looks like someone got overzealous with the CTRL-V and posted some incorrect info. Support will be Mark Spencer of The Blood Oranges. Gillian Welch (and presumably David Rawlings) will be at Exhibition Place on July 18, likely as part of the annual Toronto Star Blues Festival. Things I know about Icelandic electronic pop outfit Mum – the twin sisters were the cover models for Belle & Sebastian’s Fold Your Hands Child album, they have really cool videos, they sound like a thick warm blanket whilst camping out under a starry night and I believe one of the sisters left the band last year – don’t know if she’s been replaced. I also know that they’ll be at the Horseshoe June 25 and tickets will cost you $15. And now you know that too. Tickets for all these shows are on sale now at the usual outlets except Mum, which go on sale next Thursday (April 1), and Gillian Welch, which probably won’t have ticket info available for some time – at least until the entire Blues Fest lineup is announced. Live Neutral Milk Hotel Quicktime movies here. From Slatch. Slept for a very solid ten hours last night, and while I’m certain I had a list of things I needed to do today, I can’t for the life of me remember what they were. Maybe I’ll just go back to sleep.